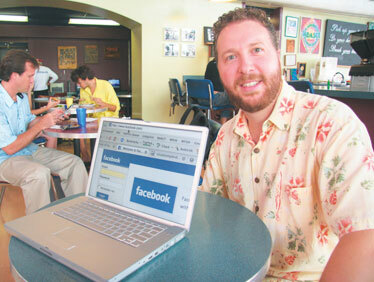 UH professor Devan Rosen, at Coffeetalk in Kaimuki with his laptop, says reality TV viewers are more willing to socialize on Internet network sites like FaceBook and MySpace. The whole point of being a star is that you're special. One thing "American Idol" and other reality shows have done is convince a whole raft of absolutely average people that singing stardom is within their grasp. This might be mass delusion, but it's also a barometer reading of an age in which private citizens are no longer private. Simply being well-known makes one a star. Call it the Nicole Richie Syndrome. University of Hawaii communications professor Devan Rosen, along with colleagues Michael Stefanone and Derek Lackaff of the University of Buffalo, have been studying the connection between reality television and what they call "promiscuous friending," where social networking sites on the Internet interlink people who have not actually met. Turns out the reality-TV viewer has a willingness to become a more public person -- or persona -- via the medium of online interactivity, like FaceBook or MySpace. We text-chatted with Rosen via e-mail about this phenomenon, which seemed appropriate. What's happening to privacy? "It's more a willingness to participate in non-directed self-disclosure," said Rosen. "A reconceptualization, or rethinking, of what it means to be 'private.' " continued Rosen. "Sharing intimate details of day-to-day experiences in a blog might not be considered an invasion of privacy. Strangers now have access to the private content of your personal page as well as their other friends' personal sites." The design of these networking sites, explained Rosen, makes it easier to maintain contact with online acquaintances, or "weak ties," and therefore users can manage a larger tribe than in the days of writing letters or chatting over fences. Television, as it turns out, is the gateway drug to harder stuff. "Exposure to violent television cultivates an exaggerated idea that everyone is out to get you and you will most likely be a victim of a violent crime," said Rosen. "This is called the 'mean-world syndrome.' Heavy viewers of television overestimate their chances of being a victim of a violent crime by almost 100 times. "Reality television, like 'American Idol,' cultivates a perspective that it is normal to self-disclose private information to the world. It is possible for anyone to be a celebrity by telling their personal story to the camera, and many of these show participants do just that. "So, if a kid grows up watching thousands of hours of reality television, they will model what they are exposed to. Web applications provide the perfect platform to do this. Millions of kids are broadcasting their personal lives to the world, as if the 'Idol' camera is on them." The concept of physical distance and isolation simply doesn't exist online. "Everyone is poking their noses into everyone else's business," Rosen said, "and many people are putting their information out there for everyone to poke into." Although he and his colleagues tested other types of TV programming to see if it gave the same goose to "promiscuous friending," only reality television shows such as "American Idol" were able to light the match. "Criminal Intent" viewers were too busy locking their doors to chat online. Is the 'Net actually broadening one's tribal horizons, or is it just helping people find more focused tribes? "Both, for sure. The 'Net allows people to find solidarity with those that they have affiliations with, from sailing groups to displaced refugees," said Rosen. "It is this sort of self-organization where the Internet shines; it is the roadmap to the small world. We can find those who are like us, but can also discover those who are not. That enables global awareness." So TV and the computer/Internet/Web are replacing the town square, the shamans, the learned elders, the old-model go-to guys? Is this a young persons' game? "Young people are certainly more talented at digesting the rich experiential elements of today's media," admitted Rosen. "Their knowledge environment is built for it. They can keep up. The way young people conceive of information is quite different. For one, they no longer need to go to an 'authority' for information, like teachers, librarians, parents, or whoever. There are dangers with this, of course, especially regarding the validity of the information they access, but there are benefits as well. We are able to pool our collective experiences and knowledge to create a true collective consciousness, a wiki of life." So what happens to society when the power goes out? "Panic for some, and an increase of red wine consumption for others!" laughed Rosen. "We are completely dependent on power, not just for delivery, but also for systemic coordination. It is as if our society lives in an ICU with full respiratory, circulatory and digestive support. "Similarly, we are dependent on the Internet for informational support, and our memory structures are changing as a result. Fortunately, the Internet is a living organism at this point, with no single entity that can shut it down, it can self-repair."